The negotiations to keep greenhouse gas emissions 2C above preindustrial levels, and do so fairly, begin in Paris on November 30th and continue through December 11th. Humanity, which has developed and thrived in the last two centuries on a fossil fuel energy base, must quickly divert to a renewable energy base for our collective survival. The heat caused by this sudden, manmade Climate Change is jeopardizing our environment, our public health, and our way of life. While much of the public, the fossil fuel companies, and many climate change deniers still (immorally) scoff at these dire predictions, 97% of climate scientists know this to be true. Even the fossil fuel industries know this, although they have been saying otherwise. In fact, many climate scientists believe that the politically-generated goal of 2C is too high and may be too dangerous. Many are hopeful that Paris will set a more realistic emissions threshold. Success at Paris is far from a done deal. There isn’t enough money to compensate (as promised) the poor nations for Climate Change catastrophes and allow them to develop without more dangerous emissions. The rich nations don’t want to make the treaty binding, which is to say they want it to be toothless. The rich nations, despite their encouraging rhetoric, are still subsidizing the fossil fuel industry (which have more money than since money was invented). All of the above issues with the COP21 compels us to a worldwide Global Climate March to convince our leaders that COP21 Paris must be a binding legal treaty. Nothing else will bring the age of fossil fuels to an end—or it already would have. In Rochester, find out about our “Rochester March for Global Climate Action” here. Ask not how the greenies are going to solve their little problem. Ask how you can help Rochester show up for our worldwide reality check. There are many ways to get involved: First, consider listening, calling in, and telling your friends and family about the Monday, November 23rd at 1PM Connections (1370 AM) program on “Rochester March for Global Climate Action” (1-844-295 8255, email, Facebook or Twitter). 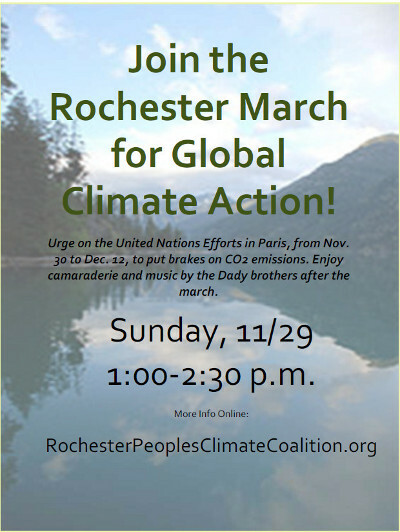 Rochester is hosting a major march in downtown Rochester on November 29th to galvanize our leaders to make the COP21 Paris Climate Treaty a legally binding treaty—and meet its other crucial goals. Our march in Rochester will begin the day before the Paris Treaty and it will be a part of a worldwide march to make our voices heard. Connections, with Evan Dawson, will have several local leaders including Dr Sandra Steingraber (biologist, author, activist) talk about the importance of the Paris treaty and why Rochester needs to chime in. Please help us make this march a success—we need thousands in the streets. Contact everyone in your social networks about this historical moment in our existence. Learn more about the march locally here: RochesterPeoplesClimateCoalition.org. Attend one of the 12 Days of Climate Action (to coincide with the 12 negotiation days of Paris). Share the march event Facebook page with everyone and get them to share this event. Attend ” YOUR FOSSIL FUEL DIVESTMENT YOUR MOST POWERFUL WEAPON AGAINST CARBON, MADE EASY" and learn how to divest from fossil fuels from a local businessman Wednesday, December 2, 7PM- 9PM, The Harley School (1981 Clover Street Rochester, NY 14618). Ask that your media highlight the march. Print and post our flyer wherever permissible—in your college, coffee shop, bar, restaurant, laundromat, wherever. Print our business-card flyers and hand them to other people. Take a selfe with you and our flyer and post it march event Facebook page and all over your social media. Don’t sit this one out. If you cannot march on November 29, assign a proxy to march for you. Paris needs Rochester. Paris may be our last chance to keep GHG emission below dangerous levels.